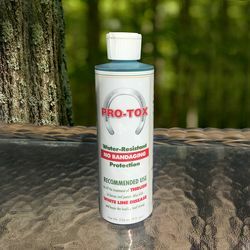 Safe and easy to use, Pro-Tox is a water resistant compound used for the treatment of Thrush in all breads of horses. It helps kill White Line Disease and keeps the hoof healthy and strong. This product contains more fungicide than any of our leading competitors which is why it can treat even the most severe episodes of Thrush or White Line in a shorter amount of time. Pro-Tox does not contain any harmful products to either animals or humans and can be used every day with no harmful side effects, unlike most. Directions: Clean the hoof thoroughly removing debris and necrotic material prior to application. Apply Pro-Tox directly to the Thrush infected area. No Bandage Needed. A water resistant compound for treatment of Thrush in all breeds of horses. Kills White Line Disease and keeps the hoof healthy and strong. "I use Pro-Care Products every day, I wouldn’t go without it." ~ Bill Jurgens, Trainer of popular SW Jilsie’s Gigalo $315,589 (136 starts). "I have always used Pro-Care Plus hoof conditioner on all of my horses. It is great for the prevention of rain-rot, and it also prevents the nails from loosening up, which is a big plus." —Barry Eisaman DVM and Shari Eisaman, Consigner of more than 100 stakes winners.